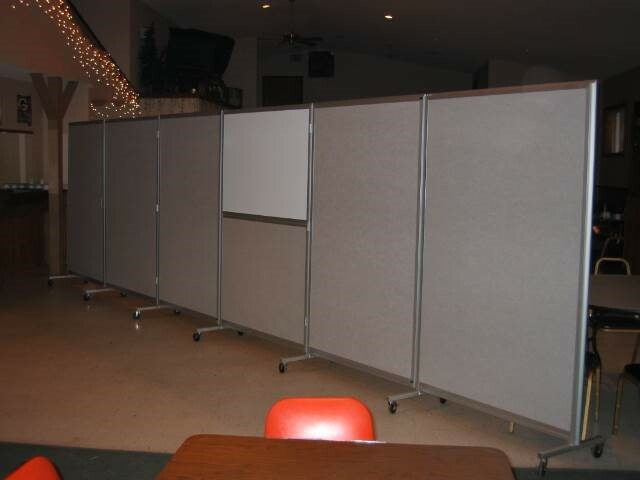 Sliding Room Dividers, Modular Walls - Panel Systems Manufacturing | Panel Systems Manufacturing, Inc.
We are the manufacturer and we sell direct. This saves you hundreds of dollars in dealer and/or distributor commissions and catalog expenses. Panels are supported by the floor instead of hanging from the ceiling. This saves you hundreds of dollars by not having to pay for expensive headers, beams or ceiling braces. Easy to install. This can save you hundreds of dollars over the cost of factory installers. If you have basic carpenter skills, you can do it yourself or hire someone locally. View a video that shows how our sliding room dividers work. To give you a price quotation we will need to know which of the three different models of room dividers below you are most interested in. They all will be custom manufactured to your exact room size. Let us know the selected model (#1, #2 or #3), the overall length and the floor to ceiling height. The basic difference in your choice of products will depend upon how quickly and easily you want to divide and restore your room size and how important is the sound reduction. #1: A Folding Divider: A free standing sight divider on caster wheels that fold for storage. FD-1 model folding Dividers are self supporting and fold into a stack for storage. The standard product is equipped with caster wheels so they can be rolled to different locations. They can be ordered with just the stabilizing legs but then each panel must be removed manually. The folding dividers can be used as a straight wall or a “U” or “L” configuration. The FD-1000 is limited to an 8′ height and we suggest limiting each unit into 32′ widths so that they do not become so heavy that they cannot be rolled easily. For wider applications we suggest overlapping additional units. Our 6′ 6″ height is the tallest unit that will roll through a standard doorway. #2: A Modular Wall: A fairly permanent divider that must be disassembled to remove. 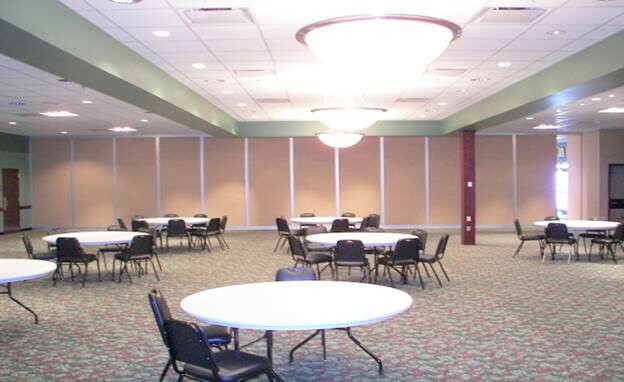 FP-1 Modular walls are best installed from floor to ceiling for sound and stability purposes. They can be installed in less than ceiling heights on short runs between corner sections or when attached to existing walls. Long straight lengths that are less than ceiling height must have some type of support to keep them sturdy. You can accomplish this in a couple of different ways and suggest contacting us for suggestions. Panels can be independently removed and replaced without disturbing the others. 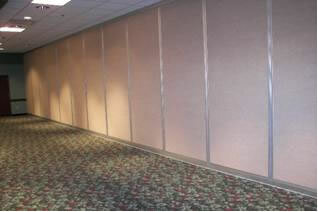 Modular walls must be uninstalled to move and are selected where a somewhat permanent room divider is preferred. #3: A Sliding Divider: Slides back and forth to divide and reopen a room in minutes. The bottom track sections are quickly and easily removed and stored vertically in a recessed area between the stacked panels and the existing wall. The floor is then completely free of any obstacles Sliding dividers do a good job of reducing sound transfer between the rooms as well as reducing the echo effect with their sound absorbing acoustical facings. 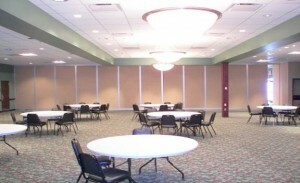 The SA- Sliding Room Dividers are limited to a 14’ tall ceiling. Most all of our room dividers can be manufactured with glass inserts, marker boards and handicapped accessible swinging doors that are located in the end panel(s). Professional installers charge a high hourly rate and sometimes travel expenses as well. So you can save a good deal of money on the installation if you can use someone in house or a local handyman or contractor. We send a complete list of installation instructions with drawings and of course I am available by telephone to talk you through any questions you might have. We have worked with different customers for over thirty years and all have satisfactorily completed their own installations. We can probably find a professional installer in your area if you prefer to use one. Please contact us for a specific quote . View sliding room details, and installation information.